We study the gene networks regulating anther and seed coat development and controlling responses to cold and drought stresses in Arabidopsis. We employ cutting-edge technologies to identify and characterize the components in these networks. The new technologies developed in these studies are being used to improve grain quality and yields. Seed coat development plays a fundamental role in seed dormancy, germination and protection. 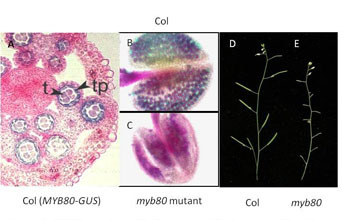 We have identified the MYB5/TTG1 network which when inhibited causes disruption in mucilage (pectin) and tannin synthesis. 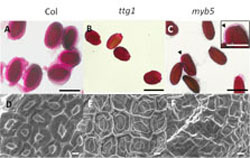 The seed coats of myb5 and ttg1 mutants exhibit reduced mucilage production and altered surface (cell wall) pattern (Figure 1). The two mutants also exhibit increased seed oil contents. Microarray analysis identified many MYB5/TTG1 target genes which are involved in these metabolic pathways. The roles of these target genes in seed coat development will be examined using T-DNA insertion mutants. The MYB5/ TTG1 network may be modified to achieve higher seed oil contents in oilseed crops. The anther tapetum (tp) provides nutrients, proteins, lipids and polysaccharides to pollen. The timing of tapetal programmed cell death, the breakdown of the tapetal wall and formation of the pollen wall are critical for viable pollen development. These tapetal metabolic pathways are highly sensitive to cold and drought stresses in several major crops. Substantial losses in grain yield occur as a consequence of these abiotic stresses. We have identified a transcription factor gene MYB80 which is involved in regulating tapetal development. The expression of the MYB80 gene is restricted to the anther tapetum and the microspores (Figure 2). Male sterility and silique abortion occur when the MYB80 gene is disrupted (Figure 2).Microarray analysis and chromatin immunoprecipitation were used to identify the MYB80 target genes. The latter include is an aspartic protease gene which is involved in the timing of tapetal programmed cell death, essential for normal pollen production. Hybrid varieties are known to exhibit increased yields and improved tolerance to stresses and diseases. Hybrid seed production requires the induction and then the reversal of male sterility. We have developed a reversible male sterility system using MYB80 for hybrid seed production. MYB80 homologues occur in flowering plants and hence our patented technology can be applied in many major crop plants. We are studying the effects of a Mycoplasma surface protein on the activation in fibroblasts of genes involved in cancer and inflammation. The research has been funded by GRDC, ARC and commercial sources.